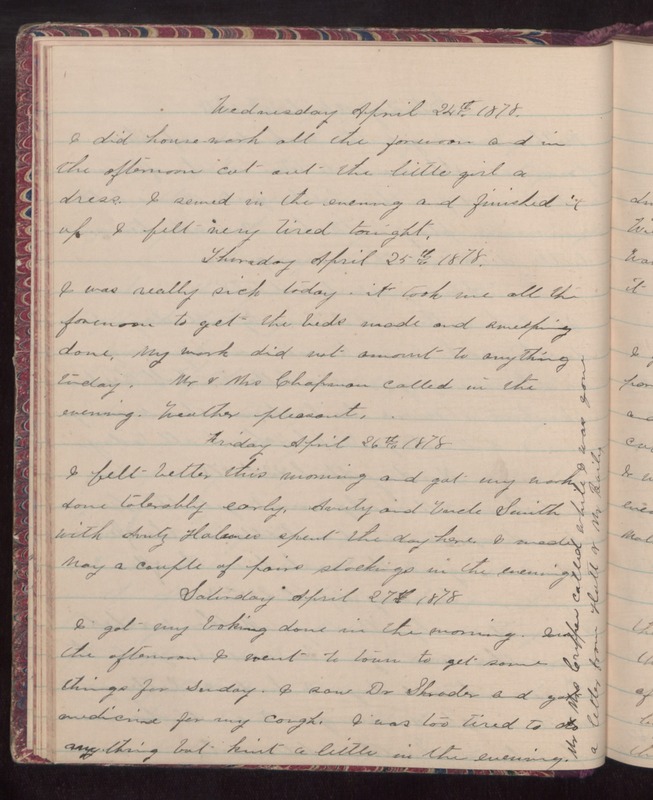 Wednesday April 24th 1878 I did housework all the forenoon and in the afternoon cut out the little girl a dress. I sewed in the evening and finished it up. I felt very tired tonight. Thursday April 25th 1878 I was really sick today. it took me all the forenoon to get the beds made and sweeping done. My work did not amount to anything today. Mr & Mrs Chapman called in the evening. Weather pleasant. Friday April 26th 1878 I felt better this morning and got my work done tolerably early. Aunty and Uncle Smith with Aunty [Hal...?] spent the day here. I made May a couple of [point?] stockings in the evening. Saturday April 27th 1878 I got my baking done in the morning. In the afternoon I went to town to get some things for Sunday. I saw Dr. Shroder and got medicine for my cough. I was too tired to do anything but knit a little in the evening. Mr & Mrs Griffen called while I was gone. a letter from Hatt & Mr Bailey.